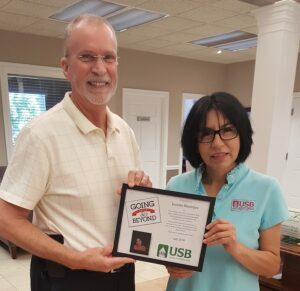 Juanita Montejos, Teller at the Main branch in Hopkinsville was selected as the July CIA of Going Above and Beyond. We received a call from a customer to brag about Juanita and the service she provides. Juanita goes above and beyond in her assistance to the customers. She also pays attention to detail and is thorough in her work. She works well with her co-workers and with employees in other departments. Thank you for going the extra mile! In the picture is Randy Coombs, Christian County Market President.